Posh fans rise to acclaim Jack Marriott after his first goal in the 4-1 win over Charlton. Photo: Joe Dent/theposh.com. 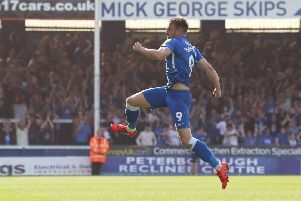 The Steve Evans era kicked off in spectacular style at the ABAX Stadium today (March 10) with a 4-1 trouncing of League One play-off rivals Charlton. Two late goals from top scorer Jack Marriott gave the final scoreline a flattering look, but there was more dynamism and more organisation from Posh under this manager. Posh striker Omar Bogle tussles with Charlton's Ezri Konsa. Photo: Joe Dent/theposh.com. Andrew Hughes opened the scoring just before the break and a Marcus Maddison penalty made it 2-0 just before the hour mark, and five minutes after Josh Magennis had missed a Charlton penalty which would have levelled the scores. The visitors did get back to 2-1 with a Michael Zyro header 15 minutes from time, but Posh finished the game strongly with substitutes Danny Lloyd and Jermaine Anderson setting up the goals for Marriott. Evans’ first team selection included a switch to 4-4-2 and a recall for teenage midfielder Leo Da Silva Lopes. It was a big ask to expect Da Silva Lopes and Chris Forrester to keep pace with Charlton’s three midfielders, but the visitors, although passing the ball neatly, played too slowly. New Posh boss Steve Evans looks on thoughtfully before the big win over Charlton. Photo: Joe Dent/theposh.com. Posh ‘keeper Jonathan Bond did spill an early Magennis shot and was doubtless pleased to see Tariqe Fosu-Henry slip as he pounced on the rebound, but apart from Jake Forster-Caskey steering a close range volley straight at Bond, Charlton had little to show for their possession. Posh didn’t pass the ball as well, but threatened more. Omar Bogle struck the post with a shot from a tricky angle on 20 minutes and Forrester curled wide with his left foot from 20 yards. Posh then won a free kick 30 yards from goal just before the break. Hughes won the header at the far post, but Magennis cleared well on the line, only for Hughes to be waiting for a tap-in when Joe Ward returned the ball into area with great accuracy. Maddison took the orginal set-piece, one of several accurate ones he sent into the area. Jack Baldwin headed an early one just over the bar. Charlton striker Josh Magennis sends his penalty wide at the ABAX Stadium. Photo: Joe Dent/theposh.com. Liam Shephard’s nudge on Magennis gave the Northern Ireland international the chance to equalise, but he shot wide from 12 yards. And five minutes later his pain intensified as Maddison was tripped in the area by Naby Sarr after a fine run and pass from Ward. Maddison, who missed his last penalty, sent Ben Amos the wrong way from the spot. Charlton kept playing their football and should have pulled a goal back midway through the half when Fosu-Henry sent a free header from six yards wide of goal. Zyro then converted a cross from fellow substitute Ben Reeves with a fine flicked header, but Evans made a couple of telling substitutions to turn the game back in Posh’s favour. Lloyd did superbly to chase a lost cause and cross for Marriott who turned and fired home through the keeper’s legs from close range eight minutes from time. And then Anderson’s perfect cross enabled Marriott to stoop and head home from close range to complete the scoring. Marriott is now on 27 goals in a remerkable season. Posh moved above Charlton into seventh, a point behind Plymouth who were held at Fleetwood. Posh: Jonathan Bond, Liam Shephard, Andrew Hughes, Jack Baldwin, Steven Taylor, Chris Forrester, Leo Da Silva Lopes (sub Jermaine Anderson, 83 mins), Marcus Maddison, Joe Ward (sub Michael Doughty, 70 mins), Omar Bogle (sub Danny Lloyd, 76 mins), Jack Marriott. Unused substitutes: Conor O’Malley, Junior Morias, Lewis Freestone, George Cooper. Charlton: Ben Amos, Johnnie Jackson (sub Nicky Ajose, 68 mins), Jason Pearce, Tariue Fosu, Ezri Konsa, Naby Sarr, Chris Solly, Joe Aribo, Jake Forster-Caskey, Josh Magennis (sub Michael Zyro, 64 mins), Sully Kaikai (sub Reeves, 64 mins). Unused substitutes: Ashley Maynard-Brewer, Patrick Bauer, Mark Marshall, Harry Lennon. Goals: Posh - Hughes (44 mins), Maddison (pen, 59 mins), Marriott (82 mins & 85 mins). Charlton - Zyro (74 mins). Cautions: Posh - Baldwin (foul). Charlton - Solly (unsportsmanlike conduct), Sarr (foul).